Why SAP Business One Cloud? Visibility into and control over your operations are important in order to stay competitive. Now, with the SAP Business One Cloud solution, they’re faster and easier to achieve than ever. You'll get the support you need – and the simplicity of the cloud. You have all the benefits of SAP Business One without the cost and complexity of deploying an on-premise solution. You pay a subscription fee which covers software, service and support. And then you can access the full functionality of SAP Business One. This cloud-based solution is managed and maintained Ochiba. This means you have access to the most up-to-date functionality without your in-house IT department having to maintain it. Plus we work with hosting providers in state-of-the-art data centers to keep your data safe and secure. SAP Business One Cloud is a managed solution. This means we host and manage the software to make sure you're always up to date with the very latest version. Choosing Software-as-a-service (SaaS) means there’s no lengthy rollout. You won't need indepth training. And there's no need for ongoing maintenance. You can get up and running quickly and with minimal disruption to your day-to-day operations. While, your IT staff are freed up to focus on other tasks. SaaS means Ochiba, can also help you “switch on” new functionality and extensions as you need them. This will help you to grow quickly and easily by taking advantage of new opportunities. SAP Business One Cloud helps you streamline processes across your organisation. With easy access to real-time data from different business area you'll have complete visibility into performance will be able to make better decisions. SaaS allows you to deploy and extend functionality quickly. So you'll see a return in investment quickly and be able to act on information immediately. Being able to move with changing market conditions will provide you with a significant competitive advantage. SaaS means you can focus on your business, not your technology. Because you don’t need to invest in hardware or IT experts to manage and support the solution, the cost is kept to a minimum. Costs are affordable, easy to understand, transparent and predictable. Charges are based on the number of users and the length of your contract. This means you can tailor the terms to fit the needs of your business. Plus, you can deploy the software quickly across your entire company. So you'll start to see a return on your investment much faster. SAP Business One Cloud delivers what you need to manage your business functions. It enables you to streamline processes and reduce errors and delays. Accounting and finance – Streamline your financial operation, from daily accounting tasks to banking and financial reporting and analysis. Sales and customer management – Manage the entire sales process and customer lifecycle, from initial contact to final sale and after-sales service and support. Purchasing and operations – Manage the complete order-to-pay cycle, including receipts, invoices and returns. Inventory and distribution – Manage your inventory using various costing methods, and gain real-time insight into inbound and outbound shipments. Reporting and administration – Generate timely and accurate reports based on company-wide data. SAP Business One Cloud is built with flexibility in mind. As your needs change, you can adapt and extend the software with add-on solutions that fulfill industry-specific and other needs. 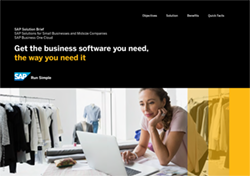 And SAP Business One Cloud runs on both the SAP HANA® and Microsoft SQL Server platforms, so you can choose the one that’s best for your business.